These cookies are absolutely delicious. 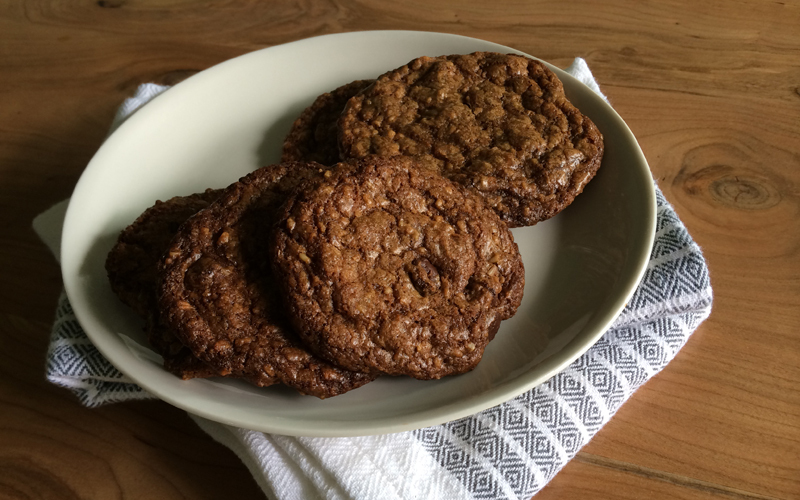 And even better yet, they’re as healthy as a cookie can get, since they’re organic and made with whole wheat flour. And now that we know that butter is actually healthy—which I have known all along—even that is safe! If it were up to me, I might have gone on to add nuts, some dried cherries, and even some chili powder. But alas, making a batch of cookies is never up to just one person when there are kids in the house—mostly because a batch of cookie dough makes a lot of cookies, and someone has to eat them. If you don’t have a bunch of hungry kids around, you might want to cut this recipe in half! Mix all the ingredients in a bowl (this will take a few minutes, since there is a lot of stuff to mix up). Put a tablespoon of cookie batter for each cookie on a cookie sheet (I like to put parchment paper down because it makes it much easier to get the cookies off the tray). Bake for roughly 10 minutes. The dough will flatten out nicely and make a gooey and crispy flat cookie, which is what I prefer. DISCLAIMER: FEEDING YOURSELF OR YOUR CHILDREN ORGANIC FOODS MAY CAUSE EXTREME HEALTH, HEALING AND HAPPINESS. I made this with my tot this morning so he can have his own hand made cookie for snack, and WE LOVED IT! I didn’t have the coconut sugar so just normal brown sugar. It was so messy and so much fun & so yummy. Thanks so much! Approximately how many cookies does this recipe make? Need to know to decide whether to make whole or half recipe. Did the steel-cut oats not work out so well? I have steel-cut oats in the house, but not rolled. Anything chocolate + coconut = awesome!! I will definitely be making these. I think I also need an oatmeal raisin coconut version. This sounds like a yummy treat! Thanks for sharing. This recipe made about 24 large cookies (they flatten out and spread). Steel cut oats are fine! Yum! I just will try rolled next time since I think it gives a more traditional “oatmeal” look and feel. Am writing you about these cookies; I may be late because I simply haven’t had time to do it. In any case, I made a batch of them and I feel that there’s something missing, like not having enough body. I don’t know if you understand this; or maybe am comparing to your usual store bought cookie. They have more body. I used rolled oats and added sliced almonds along with the rest of the ingredients. To me, they were too chewy because you have the oats, coconut, and almonds to bite into. Maybe if it was made without the oats, you could add the nuts and dry fruits. Anyway, the flavor is pretty good and everyone who had them liked them a lot. I do think that the recipes should mention the yields and details like how many inches apart should each tablespoon of batter be placed onto the baking sheet, etc. This is good for people who have never made cookies before, like me. Thanks for the recipe and I will make some more maybe with dry fruits. @ Debbie.. I’ve been making my own cookies from scratch and noticed in other receipts that call for brown sugar, that the amount of brown sugar determines the softness of the cookie, maybe change the ratio from 3/4 cp, BS. to 1/2 cp, and bump up the other sugar the difference. see how that works. what is the exact measurement for a stick of butter? I made these and they were super, making 48 3 inch cookies, which was a lot but they freeze great, texture/ taste were right on. I would like to use coconut oil which is now solid, has any one tried it? and would like to add orange flavor or almond and dont know how much extract to add. Any suggestions?